hatching a patch: Samantha, here's a bug to rival your bug! Jose found this in the backyard a couple days ago. This is why I really don't go back there anymore. 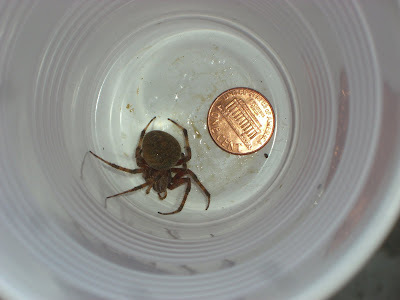 He caught it and I dropped the penny in the cup and took the picture. I don't care how "cool" people think spiders are--I hate them! What kind is it? The burnt-to-a-crisp-after-the-photo-was-taken kind. Boo-yah! I probably will get some flack, also, for calling a spider a "bug". It's not a bug, is it? thats pretty gross and furry. i will have to try to find out what it is now. Yeah, it does! Good hunting! Ewwww. Last night, I went into the shower after a long day. I actually had dirt and dust in my bra from being at two parks in one day. I felt so gross. I just wanted to take a shower and rinse off the day. Well as soon as I turned on the water, there was a big ol spider waiting for me. I let the water run on him and drowned him. Then I felt bad. But then I imagined him crawling up my leg. So I felt better. This one really freaks me out. Where was it when you found it? Oh, I can't tell you how many times that has happened to me, Iris. Except for the dirty boobies, that hasn't happened very often. Jose found the spider, he said, creeping along the cement ground between chairs, dragging a big thick string of his own goopy silk thread. Since we had that bbq the prior weekend, Jose had cleaned the patio furniture and we sat out there a few times--makes me cringe just thinking how close these things were to us. Did someone say something about spiders?